45 mm steel case, 3.95 mm thick, steel bezel, black dial with classic dial which ensures excellent legibility, calibre p.4000 automatic movement with hours, minutes, small seconds, approximately 3 days of power reserve, black alligator strap. Water resistant to 10 bar. 45 mm red gold case, 3.95 mm thick, red gold bezel with composed of gold, copper and other metals, brown dial, calibre p.4000 automatic movement with hours, minutes, small seconds, approximately 3 days of power reserve, dark brown alligator strap. Water resistant to 5 bar. 45 mm brushed titanium case, 3.95 mm thick, sapphire back, brushed steel crown, polished titanium bezel, brown dial, calibre p.4000 automatic movement with hours, minutes, small seconds, approximately 3 days of power reserve, dark brown buffalo strap. Water resistant to 10 bar. 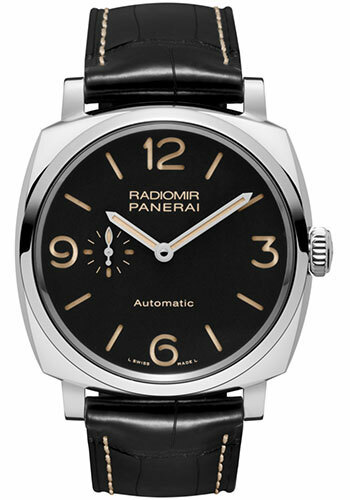 42 mm polished AISI 316 stainless steel case, see-through sapphire crystal back, black dial with luminous Arabic numerals and hour markers and small seconds at 9 o'clock, P.4000 calibre automatic movement with hours, minutes, small seconds, approximately 3 days of power reserve, black alligator strap with beige stitching. Water resistant to 10 bar.